Salmon fishing in the Portland Oregon and Vancouver Washington area is starting to pick up. 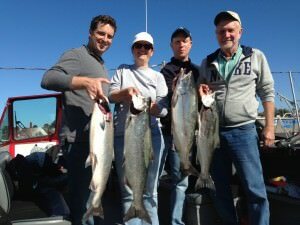 Book a trip today for Portland,Oregon Salmon fishing. I will continue to fish salmon in the Portland Oregon and Vancouver Washington area through the early part of June. Middle of June we switch over to summer chinook salmon. This fishery is mainly done on the Columbia River which borders Oregon and Washington. I meet my clients at a Portland, Oregon Marina. Walleye fishing on the Columbia River has also started to really pick up In should just continually get better and better. Walleye fishing also is done on the Columbia River in the Rufus Oregon area. If you’ve never had a walleye fish taco you’re gonna wanna try it. Here is a nice recipe for walleye fish tacos you might want to try. mix some eggs together, throw some garlic salt and pepper. Coated the fillet, then cover it with breadcrumbs. Let it sit for 5 min. Heat up olive oil in a skillet, then cook for just a few minutes each side. Done. Yum! Maybe you like a challenge, maybe you wanna catch a river monster. If the sound fun for you Let’s go catch Columbia river Monster Sturgeon. Sturgeon will be ranging between 4 and 10′ long. Reminder sturgeon catch and release only. Bring your camera and be ready for some fantastic photo opportunities. Salmon, Sturgeon, Walleye, give me a call I will get you hooked up for some great fishing action in the Portland, Oregon and Vancouver Washington area.